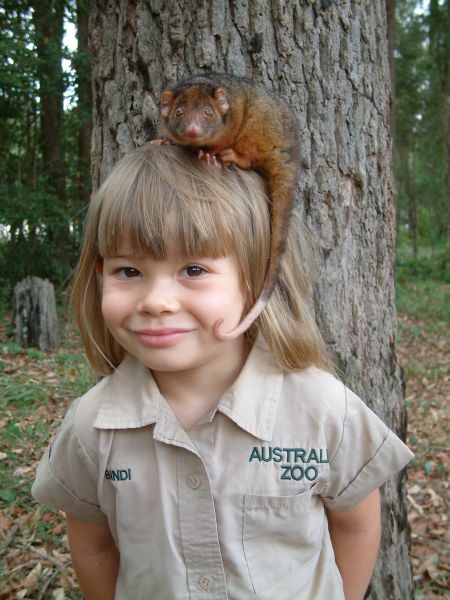 Bindi smiles as the Possum sits on her head. Hi, Bindi. My brothers (Caleb & Timmy) and I are so inspired by your show \"Bindi the Jungle Girl\" . Through this, we became more appreciative of animals . Wow,you are so brave like your dad! How I wish I could have such courage. Keep it up! She is so ugly! How come she got wrinkles under her eyes already? She definitely needs eyelid surgery to look human and normal! Maybe her real father was Mongolian? your such a brave and cute! cute! child! CUTE CUTE CUTE CUTE CUTE CUTE CUTE CUTE CUTE CUTE CUTE CUTE CUTE!!!!!!!!!!!!!!!!!!!!!!!!!!!!!!!!!!!!!!!!!!!!!!!!!!!!!!!!!!!!! many people knew him as the croc Hunter. when i fgund out he had passed away it made me stop and think the love ones you have make them feel like they are loved and wanted don't miss teat people and LOVE anyone and everyone. See Ya!!!! Long live Steve's memory. He was a wonderful man, a dedicated conservationist and a devoted family man. God bless you and your family. Hi Bindi, your such a brave little girl, your daddy will be so proud of you as he loks down on you and sees that you are carrying on with his wonderfull work, you are one little superstar,lots of love, Sue, England. Be strong Bindi we all know you can your just like your dad!!! No, that's not a Tasmanian Devil, that looks more like an Eastern Quoll or a Brush-tailed possum. That's the closest I can pin it, though if anyone else knows, please correct me. This is not a Tasmanian Devil! !